If Asian food is one of the best and most varied in the world, imagine a country with its own delicious cuisine plus a healthy dose of Asian ingredients and cooking styles. 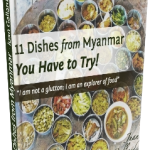 Burmese cuisine is also very healthy, favouring fresh fruit and vegetables, as well as fish products like fish sauce and fish paste and fermented seafood. For adventurers, Hsipaw and Kalaw are two great cities to be in touch with nature and do trekking while Kakku Pagodas are the must see religious site. This is one of the dishes I tried on my first visit to Myanmar. It stuck with me and I definitely had to learn how to cook it. It’s so good! For cooking the rice there is no trick, just wash it, add water, turmeric powder for the yellow colour, salt and a little bit of chicken powder. There are two different tomato sauces, one to mix with the rice and another one to put on top of the rice cake. It is really interesting to see how they prepare it. They place the cooked rice into a stone “bowl” situated in the ground and add black round sesame seeds (already mashed) and salt. Then there is a “wooden machine” that will smash and mix it making a dough. And this is it. To sell it, they separate the dough into small portions of the same size and wrap it in banana leaf so it doesn’t dry. The most popular and tasty ways of having it are fried or barbequed, although you can also eat it raw. It is usually eaten in winter and served with brown sugar or jaggery on the side. It only costs between 100-200 kyats ($0.1 – 0.2). Next time you are in Shan State, don’t forget to try these delicious dishes and enjoy them as I did. 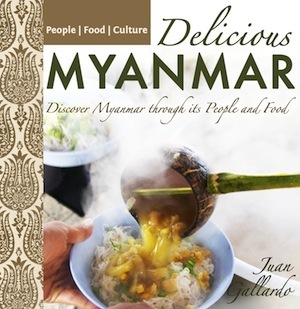 And if you love food and Myanmar as much as I do, check out my book Delicious Myanmar to discover this amazing country through its People and Food. This makes me want to immediately go trekking and dining in Burma. The article is a wonderful description of the possibilities of authentic ethnic experiences that must be experienced. Shan State is fascinating and worth to visit with plenty of time to explore the rural side and taste the amazing cuisine.